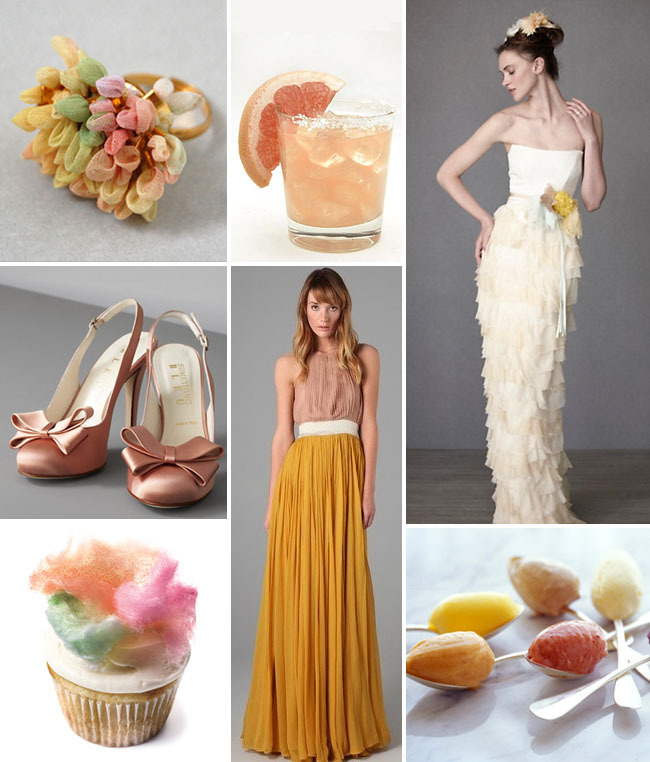 What’s more perfect + summery than a wedding inspired by the colors of sorbet + cotton candy! Super fun. I love these colors and think those cotton candy cupcakes make such a fun dessert along with bites of sorbet. Start the evening off with a grapefruit margarita and your ready for a perfect night. First off, I can’t believe what we can do with cupcakes these days. Cotton Candy on top? Yes please. And I made the grapefruit margaritas a couple weeks ago and have been hooked ever since! Gorgeous board!!!! Those touches of mustard are gorgeous with the pastel shades and the textures are very touchable too! I love the grapefruit margaritas!!! And the cupcake poofs are so cutes. Loving the fluffy chiffon look of the bracelet and dresses! And it goes great with satin. Loving these perfect colors! Thanks for sharing. just wore the exact mustard/grapefruit color combo to a wedding a month ago! love this palette! those cupcakes need to be consumed now!! Plum Pretty Sugar for Your Honeymoon + a Giveaway!